Mumbai, 27th January 2017: The game between hosts Dabang Mumbai and defending Champions Jaypee Punjab Warriors here at the Mahindra Hockey Stadium on Friday featured every ingredient to make it a pulsating encounter that left the Mumbai spectators wanting more. It was a high-scoring game, no doubt, with home team pumping as many as five field goals by Nikkin Thimmaiah (6’), Florian Fuchs (30’ and 43’), Affan Yousuf (49’, 50’) that earned Dabang Mumbai their second win on the trot in the fifth edition of the Coal India Hockey India League. As per the new Regulations, a field goal amounts to two goal and there were as many as seven field goals scored today. It was an action-packed first quarter with home team Dabang Mumbai getting off to a rollicking start even as defending champions pressed hard high up the pitch. But the home team found an early break through Nikkin Thimmaiah, who played a crucial role in the team’s late goal in their opening game against Ranchi Rays that resulted in a draw. He earned the team their first goal in the 6th minute. It was Emmanuel Stockbroekx who showed class with his dribbling, managed to isolate Jaypee Punjab Warriors’ defender Baljit Singh, made his way into the opponent’s circle and found Florian Fuchs who had positioned himself perfectly to score but his attempt rebounded from the keeper, however, a quick-thinking Thimmaiah sent the ball into the post giving Dabang Mumbai a 2-0 lead. The defending Champions leveled the score in the 13th minute when Matt Gohdes stole the ball from Harmanpreet Singh in the midfield, raced towards the striking circle beating the Dabang Mumbai defender Sander De Wijn to score a splendid goal for the visitors and levelling the score to 2-2 ahead of the first break. The second quarter saw both teams earning penalty corners but neither found success in converting them. However, they continued to keep up the high tempo of play with Jaypee Punjab Warriors dominating possession and play but unable to find a breakthrough for the lead. It was Dabang Mumbai’s Captain Florian Fuchs who enthralled the evening audience with an inspiring and fierce individual skill. It was precision at its best when he struck a brilliant goal in 30th minute that doubled the lead for his team. There was little Jaypee Punjab Warriors goalkeeper Tristan Clemons could do to stop that goal. Jaypee Punjab Warriors opened the third quarter patiently, rotating the ball between themselves waiting for an opening into the Dabang Mumbai defence. Despite the several circle penetrations, it took them a while to materialize. Though they earned a PC in the process they failed to convert. 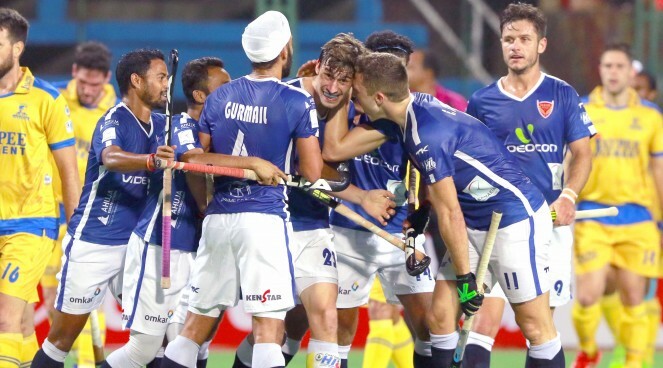 German Olympian Fuchs, on the other hand, continued his sensational run in the league, with yet another incredible goal in the 43rd minute to give Dabang Mumbai a dominating 6-2 lead. Nikkin Thimmaiah did exceptionally well with the tackle to assist Fuchs with a perfect pass and there was no way Fuchs would let that opportunity go in vain. Jaypee Punjab Warriors were not the ones to lag as Junior World Cup hero Armaan Qureshi, brilliantly assisted by SV Sunil, scored a pulsating goal in the 44th minute to narrow the gap for the visitors. The third quarter ended with the score reading 6-4 in favour of Dabang Mumbai. Young Affan Yousuf played an instrumental role in taking the Dabang Mumbai’s lead to a comfortable 10-4 when he scored a quick double in the 49th and 50th minute that ensured the defending champions started the League with a loss. Matt Gohdes of Jaypee Punjab Warriors was awarded with a prize money of Rs 50,000 for scoring the Coal India Goal of the Match from Mr. Surojit Sarkar, Manager – Finance, Coal India Ltd.
Armaan Qureshi of Jaypee Punjab Warriors won the prize of Rs 25,000 for being the Hero Young Achiever of the Match from Olympian Mr Viren Rasquinha. 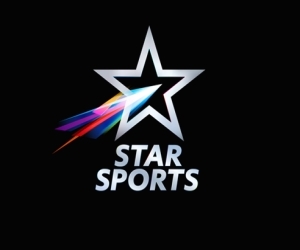 The Most Entertaining Player of the Match was awarded to Affan Yousuf of Dabang Mumbai that came with a prize money of Rs 25,000 by Mr. Anil Jayaraj, Executive Vice President, Star Sports. Dabang Mumbai’s Florian Fuchs was declared the Man of the Match and was awarded a prize money of Rs 50,000 by Mr. Saumya Khaitan, CEO, Dabang Mumbai Hockey Club. On 28 January 2017, Ranchi Rays will take on Delhi Waveriders in Ranchi.